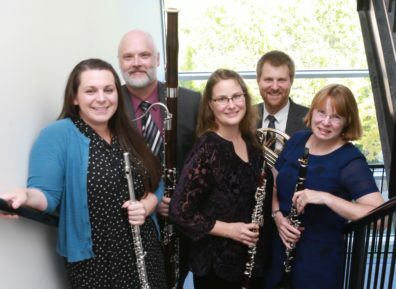 The Solstice Wind Quintet will present a program of works by composers active in Europe from the late-19th century to present day. The concert will open with one of the most frequently performed works in the repertoire- Quintet, Op. 43 by Danish composer, Carl Nielsen. A recently completed work titled Woodwings by Emily Doolittle (composing in Scotland) will follow, suggesting the sounds of avian nature. Pianist Jeffrey Savage will join the Solstice Quintet for the conclusion of the program, with a performance of the late-Romantic Sextet by Austrian composer, Ludwig Thuille. Proceeds from ticket sales in the series benefit the School of Music Scholarship Fund. Tickets on sale one hour before performances in the lobby. Cost: $10 general admission, $5 senior citizens (55+)and non-WSU students and free for WSU students with ID.